With another deadly climate disaster in the Philippines taking 10,000 lives the world is sure to be more aware of Climate Change. It's a slow awareness, creeping into daily life. The more awareness that human activity causes climate change, the more people start to wonder what they can do to help stop it. 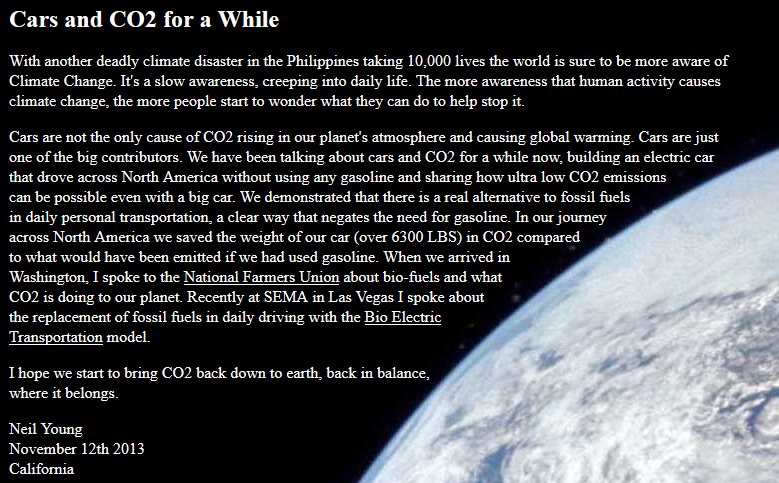 Cars are not the only cause of CO2 rising in our planet's atmosphere and causing global warming. Cars are just one of the big contributors. We have been talking about cars and CO2 for a while now, building an electric car that drove across North America without using any gasoline and sharing how ultra low CO2 emissions can be possible even with a big car. We demonstrated that there is a real alternative to fossil fuels in daily personal transportation, a clear way that negates the need for gasoline. 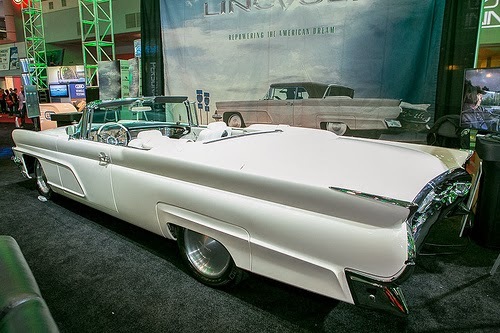 In our journey across North America we saved the weight of our car (over 6300 LBS) in CO2 compared to what would have been emitted if we had used gasoline. When we arrived in Washington, I spoke to the National Farmers Union about bio-fuels and what CO2 is doing to our planet. Recently at SEMA in Las Vegas I spoke about the replacement of fossil fuels in daily driving with the Bio Electric Transportation model. We applaud Neil for his stand, commitment and passion for action. As we blogged last week, ultimately, we're all on the front lines of Climate Change. Check over on Neil Young's official website for Next Steps in Climate Change actions. Also, see video below of Neil Young's Green Performance Keynote @ SEMA Trade Show in Las Vegas from last week. The keynote contains footage of LincVolt's travels into the Alberta Tar Sands mining in Canada which ignited a firestorm of criticism in Fort McMurray and support around the world. Great talk Neil. He is completely right about the batteries. There should be a standard for car batteries just like all the small batteries. Did Neil say that he has a new job ... ? You should post the part of the show where Neil and the team answers questions from the audience as well! As much as I like the fact that Neil really tries to make a different for the global environment, I think he's got a couple of things wrong. And I think he's pretty stubborn and not very open to criticism. On interesting point is, where do the energy you use to charge your plug-in hybrid come from? If your power grid is fueled with oil or coal your using you might end up emitting as much or more pollution as a traditional vehicle in order to charge up your car. This is shown in multiple studies. According to the Environmental Protection Agency nickel is a probable human carcinogen, and improperly disposing of nickel-hydride batteries can pose an environmental hazard. Also, the website HybridCars, states that there are environmental concerns regarding the mining required to create these batteries. In addition to the nickel used in some HEV and PHEV batteries, HEVs and PHEVs use large amounts of copper in their electric drive motors and wiring. Like nickel, copper must be mined and is mined either from open pits or underground mines in a way that can lead to further environmental degradation. It is found that copper mining contributes to particulate air emissions of various metals and sulfuric acid. It is possible for mining companies to mitigate most of these emissions, but not all copper mines do. Open pit mining is also known as strip mining, and involves the stripping of surface grasses, trees and dirt to unearth the deposits of minerals. When it comes to recycling of the batteries, on the paper a great idea, you also got problems. For Li-Ion batteries(used by most hybrids and electrical vehicles) : they don't contain any scarce materials. They don't have any economic value, also because they are a few actors capable to process Li-Ion batteries. It is not recycled, just burned. I love your your blog, but I would very much like to see a little bit of open minded rational thinking from your side as well. I have read a lot of your posts and comments regarding this matter and you never seems to wanna listen to the critics. I important to focus on both positive and negative sides of this. Just because Neil is your/our hero doesn't mean everything he says is 100% right. In my opinion it seems like you guys think he is. Regarding energy to charge plug-in hybrids, check Neil's LV site for details. Essentially, charging occurs at night when demand is lowest and electricity is generated using non-peak resources. As for batteries, what do you suggest as an alternative? Thanks for the feedback. We try and present a balance here. As a regular reader, you certainly have seen a fair amount of negative comments that we've allowed over the years. As for dwelling on the negativity? Why? Isn't there enough in this world already? We're trying to be postive and present only "The Wheat". So much of this negativity is simply chaff to us. We've never implied that everything Neil says is 100% right. We'll just point back to the announcement that NYA would be available as Bluray only to make our point, if you'll recall that episode. Or the whole Sit vs Stand debate which seems to have led to concerts with GA pits. Again, we think that Neil and our fellow fans have had a lifetime of hearing folks tell us "he can't sing", etc. We're pretty certain that's not why folks visit TW. Lastly, unconditional love. Try it sometime. Thanks for not giving in or giving it up, Neil! Thanks for your answer thrasher! I like the thought about every hybrid being charged at night when the demand is at its lowest, that would really be something. But I´m not sure about how it would work out. People tend to do what suits them best. Another scenario, what if we get to a place where 50%+ of all cars are hybrids or electrical powered. And everybody charged them at night. What would that do to the demand? I don't think you never write something critical about Neil. I just find it a little strange that you are so closed for other opinions regarding this matter. Where I'm from(Norway) the government are striking hard to get us to use more public transportation and if that's not an option get us to ride with colleagues to work. If everybody would be willing to that, it would have a massive impact on the co2 emission. Way to many are riding alone in their car. But that may not be an option in the US? Actually the second largest car manufacture in Europe, PSA, are working on something called the "air-hybrid". Basically a combustion engine that compresses air and stores it in a tank within the car. You can drive it all on the compressed air(for shorter distances), combined or just on the combustion engine. In other words it works just like the hybrids of today, you only use air instead of batteries. Combined with Neils fuel it should be worth something! I'm sorry for my negativity, but the climate change we are creating is such a threat for the next generations. Something needs to be done! And thanks to Neil for his passion, I just think his solution to it is very short termed. We need to drive less, we need cars with lower emission, we need cleaner fuel and we need to get rid of the batteries + the mining required to create the batteries! In that order. Btw, I attended the Crazy Horse show in Oslo, the last show before the tour got cancelled. The best show I've ever seen! Something I will remember to the day i die! I'm glad NY is asking the questions and trying to find the answers. I don't think Electric or Biodiesel or Hydrogen are the answers though but if people keep asking maybe we'll find one someday, or there might not be one. It sure it disconcerting to hear him refer to himself in plural tense like some rich famous celebrity though. I've never called myself "we" but once you talk about yourself for long enough I guess it starts to sound better than "I" all the time. I meant if it's powered with oil or coal not that it is. At the moment 42 % of the US electrical power is produced by coal. I read some articles about the matter and US government are really making an effort to become more eco-friendly. Very good. Still China are the largest consumer of coal in the world and they now got a larger personal vehicle fleet than the US. I see your point about the large distances in the US. But I think it's more important with a good public transportation option in the larger cities. It's where most of the people live. And you don't see car jams anywhere in Europe as large as the ones you got in the US. There are so many ways to make this better! Most importantly people need to change their way of thinking! If you saw the link I posted about the air hybrid in my previous post, I think thats a way better idea than a hybrid with batteries. And I think the European car manufactures and the ones from Asia(Japan, South Korea etc..) are making a way better effort to make more eco-friendly cars and engines than the ones in the US. I applaud Neil for trying, just don't think the electrical cars and hybrids are the future. It just removes the problem from one place and puts it somewhere else. Thanks Dan & Bjorn for the thoughtful, respectful conversation. Dialogs like this are the only way that we'll all make progress towards a better solution for the future. Negativity sometimes wears a disguise called ‘reality'. Thanks for keeping it real!